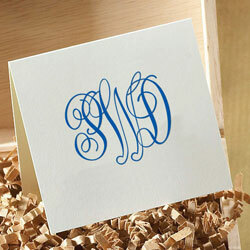 This classic square folded gift enclosure measures 3" x 3" in paper colors white or ivory. Monogram includes 3 letters, with the center letter (last name, being slighly larger. Ink Colors: Fuchsia, navy, black, red, emerald, slate, mocha, purple, ocean, or sage. 50 envelopes included.